" Street Sans Frontières, an exhibition curated by Martin Vegas, will be attended by authors from 5 continents who showcase what happens in the streets of the world. From amateurs to established artists, these photographers are able to capture stories in different forms and deliver them to us, through the outstanding and inspiring images we are proud to share. With the participation of the Paris-based collective Fragment." I am very happy to announce that I will be showcasing 4 photographs from my London series as part of Street Sans Frontieres exhbition in Paris. Please come and meet us if you live around! We will have an opening party starting at 6pm, Friday 12th May 2017, at Espace des Arts Sans Frontieres, 44 rue Bouret, Paris - Metro: Jaures. Here are some excerpts from the collective's website regarding the upcoming exhibition. In 1952, Henri Cartier-Bresson (1908-2004), commonly considered as the pioneer of street photography, published his book Images à la sauvette, whose English-language edition was titled The Decisive Moment. It included a portfolio of 126 of his photos and for his philosophical preface, Cartier-Bresson took his keynote text from the 17th century Cardinal de Retz, "Il n'y a rien dans ce monde qui n'ait un moment decisif" ("There is nothing in this world that does not have a decisive moment"). Cartier-Bresson applied this to his photographic style. He said: "Photographier: c'est dans un même instant et en une fraction de seconde reconnaître un fait et l'organisation rigoureuse de formes perçues visuellement qui expriment et signifient ce fait" ("To me, photography is the simultaneous recognition, in a fraction of a second, of the significance of an event as well as of a precise organization of forms which give that event its proper expression"). Sans frontières is the French equivalent for 'without borders'. New borders are increasingly being constructed in the world, be they physical or social, or simply ones in our heads. Better than any other art form or language, photography can document the world around us, crossing the borders and seeking the beauty overlooked by other people. In every corner of the world, street photography captures the essence of diverse people, cultures and traditions. Beyond an interest in photography and love for travelling, some authors are inspired to find space for new narratives that may not have been previously considered. Thinking about images via juxtapositions and visual arguments, the exhibition will show the instant pulse of urban places and the scenes of everyday life blended with the photographer's attitude in exploring new territories and cultures. The concept of "no borders" also relates to technical aspects of photography. 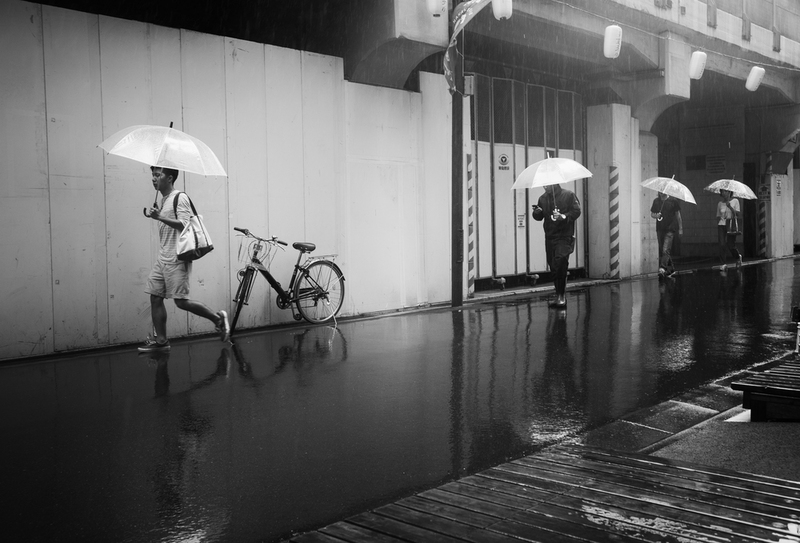 Street photographers are not limited to using film or digital, shooting in black and white or color, utilizing a real camera or a modern smartphone. With its rich heritage, Paris is a hugely popular destination where the passion for photography can be satisfied, either as a photographer or collector. As everybody knows, photography was born in Paris. It seems reasonable to assume that also Street Photography also finds its roots in Paris. The buzzling and cosmopolitan French capital and its people attracted early photographers like Eugene Atget who took his camera from the studio out into the streets. Few years later it was Henri Cartier-Bresson who made an art out of taking candid images of human activity in urban environments. But the very first Street Photo was this one, taken by Louis Daguerre, who was trying to capture Boulevard du Temple, a busy Parisian street. Taken in 1838, or in 1839, according to different sources, this is believed to be the earliest photograph showing a living person. The street was busy, but since the exposure lasted for ten minutes the moving traffic left no trace. Only the two men near the bottom left corner, one apparently having his boots polished by the other, stayed in one place long enough to be visible. As with most daguerreotypes, the image is a mirrored negative that appears as positive when no reflections of bright light disturb the view on it. I am very happy to announce my participation at Everybody Street to Indonesia, a street photography exhibition taking place in Batam, Indonesia, and showcasing the work of many street photographers that I very much admire. If you are lucky enough to be in Romania Sept 5th - 14th, don't miss the Bucharest Photo Week ! Organized by the fantastic Mirela Momanu and her team, there will be events everyday, exhibitions, workshops etc. I am very honored to participate to this first edition as a guest to the PhotoTeam's street photo exhibition - a super talented group of Bucharest street photographers. Fred Fogherty will also team up with Mirela to provide a free street photography workshop during the festival. With this collection of black and white photographs, Chicago-based street photographer Marie Laigneau explores the relationship that connects people to the city they belong to – either consciously or unconsciously. Through the use of light, shadow play and reflections, the cities we’ve known forever take the substance of dreams - ethereal and mysterious, foreign and strange. By looking at cities differently – not for what they are, but for what they could be – Fragments of Dreams explores the unconscious emotions connecting us to the city, and to ourselves. Here we go. 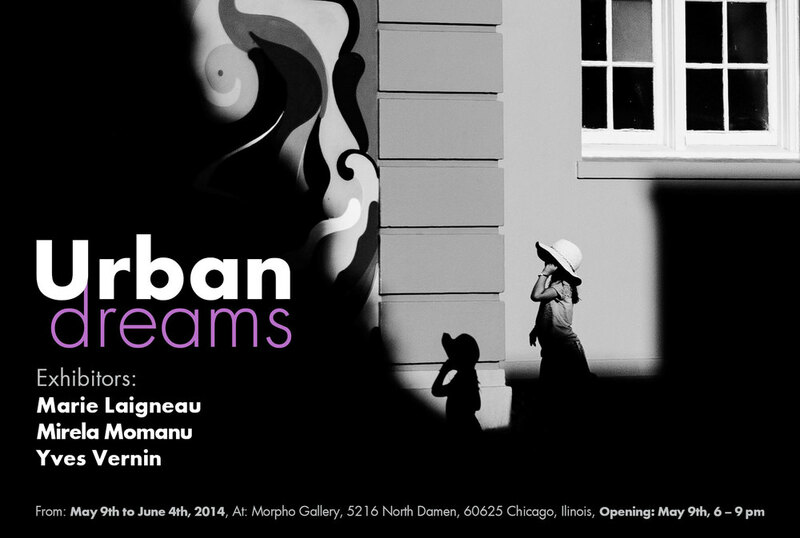 In two weeks, we will have the opening reception for Urban Dreams, our new exhibition at the Morpho gallery in Chicago. And I can't wait for it to happen! The exhibition will feature the work of my two dear and so talented friends Mirela Momanu and Yves Vernin. Opening night will be Friday May 9th, starting at 6pm. The show will run from May 9th to June 4th. Here's the information if you are planning to attend: Morpho Gallery, 5216 North Damen, 60625 Chicago, Illinois. Urban Dreams explores the mysterious and invisible relationship connecting people to their urban surroundings. Through the use of unusual perspectives, shadow play and reflections, the cities we’ve known forever take the substance of dreams - ethereal and mysterious, foreign and strange. As a group of artists, we are seeking to question the way we usually experience urban life. By transforming the ordinary into the extraordinary, by casting a new light on the most usual scenes, our intention is to unveil the unconscious emotions that connect us to our cities, and to ourselves.